Working from my “Straw Bale” workshop which is heated from the waste sawdust/chippings, the off cuts also go towards heating my house! This coupled with “living over the shop” I am keeping my carbon footprint to an absolute minimum. The structure went up over a weekend and it was roofed the following week. It was a very Amish affair. Amazingly quick to build at a minimal cost. 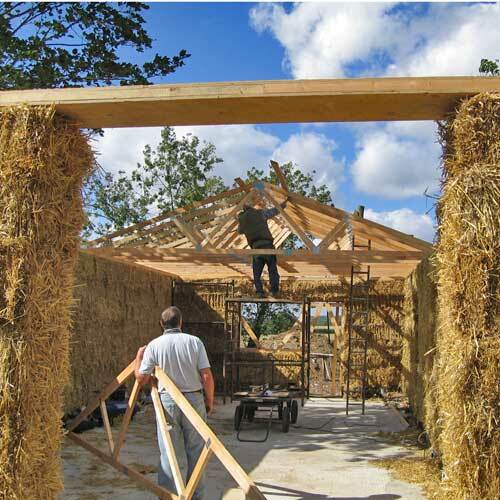 The key to this was its construction using the "Nabrasken method" where the straw bales are used as structural building bricks, pinned together with hazel sticks and then the whole wall bound together with plastic banding. Finally the building is covered with lime render which weather proofs, fireproofs and keeps the vermin out!